We'd like to thank a number of people who without their help, 2042 would not have happened. and to the Inner West Cultural Services, Marrickville Council and Art and About. 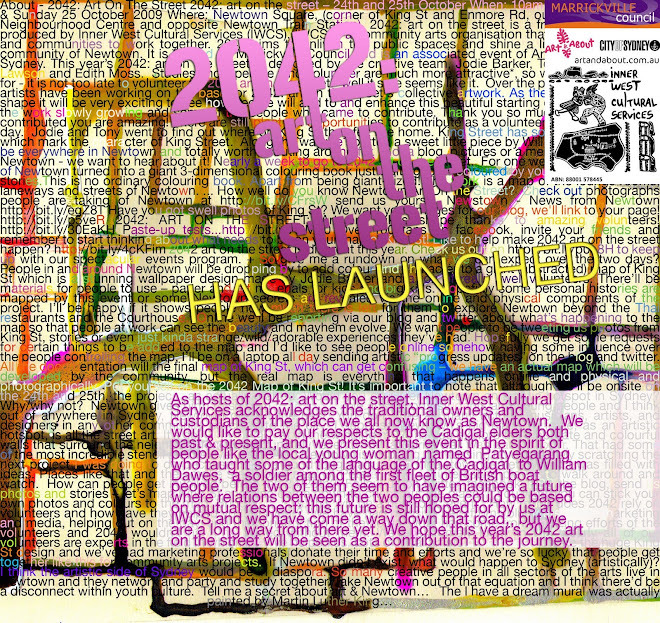 This year's 2042: Art on the Street was curated by Camilla Lawson, Tony Curran, Edith Moss and Jodie Barker. well done for a fabulously colorful and interactive space..
Because it's great for a messy night out! Beause there are great festivals and events! 2042: art on the street – 24th and 25th October When: 10am - 4pm, Saturday 24 & Sunday 25 October 2009 Where: Newtown Square, (corner of King St and Enmore Rd, outside the Newtown Neighbourhood Centre and opposite Newtown Train Station). 2042: art on the street is a free annual art event produced by Inner West Cultural Services (IWCS). IWCS is a community arts organisation that encourages artists and communities to work together. 2042 aims to enliven the public spaces and shine a light on the creative community of Newtown. It is funded by Marrickville Council and is an associated event of Art and About, City of Sydney. This year’s 2042: art on the street is designed by the creative team, Jodie Barker, Tony Curran, Camilla Lawson and Edith Moss. Hurry down to 2042 this weekend! 2042 - this weekend only!